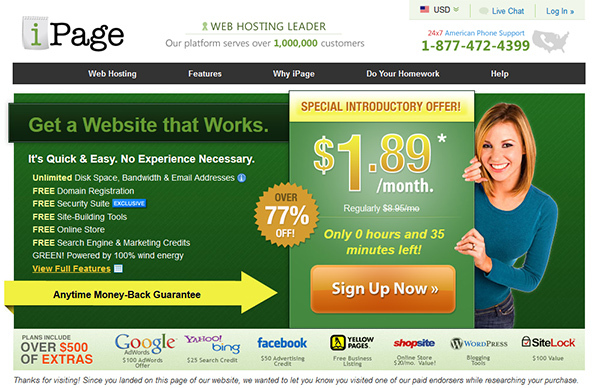 With prices as low as $2.25/month, iPage has been turning the website hosting world upside down recently. While some companies offering reduced prices will cut back on service, iPage delivers surprisingly extensive features, including unlimited storage, bandwidth and databases. In terms of building your site, you’ll have your choice between drag-and-drop and template-based site building, depending on how big a site you’d like to construct with iPage. To attract people to your impressive new site, you’ll have $175 in ad credits for the world’s most popular websites, like Google, Yahoo! And Bing. With 24/7 phone, chat and email support to back you up, you can receive help whenever you need it and build your site whenever you have free time. In fact, it’s hard to think of many sites that offer the extensive list of features that iPage does, much less one’s that cost only $2.25/month. When it comes to easy site building, iPage offers the two most popular options: drag and drop and template based. Using a drag-and-drop builder will give you a little more freedom, allowing you to place components wherever you want on your webpage. While similar, a template-based builder has the components put in specific locations on your page, allowing you to quickly swap in your own pictures, text or products. Email address setup can be just as easy, giving you quick access to your own email at your own domain name. You’ll also have full control over webmail, email forwarding, autoresponding and customizable spam filtering. Beyond simple site building features, iPage also supports a plethora of third party applications, such as Joomla, Drupal, WordPress, Gallery2, Coppermine, Gbook and phpBB, just to name a few. You’ll also receive support for Shockwave, MIDI and flash, as well as PERL scripting language. If you’re looking to sell products or services online, iPage also has a huge amount of support for all of your needs. With 3 shopping carts to choose from (ShopSite, osCommerce or AgoraCart), you can contrast and compare which service could work best for your needs. Even more conveniently, you’ll benefit from automatic PayPal integration, letting you take advantage of the most common method of online payment. Having a storefront setup, though, is no guarantee of sales. That’s why iPage offers $175 in advertising credits to help bring interested consumers to your site. These Google, Yahoo!, Bing and Facebook credits ensure that your brand is visible on the most popular sites on the Internet. To ensure that you are maximizing these advantages, iPage also offers convenient analytics and reporting to show how well your site is performing. You can also inspire confidence in your visitors by having impressive security protections. A shared SSL (Secure Sockets Layer) basically ensures that your visitors’ personal information is protected and encrypted from identity thieves. Your site will also undergo daily malware and spam scanning to ensure that people visiting your site are safe from viruses. iPage’s attention to your site’s safety only further proves the company’s dedication to you and your success. Beginning with its extensive online help center, iPage proves its dedication to helping all of its customers succeed. For advanced problems, you can fill out an online ticket or view one of iPage’s many step-by-step tutorials. If you need someone to hold your hand through a procedure, though, you’ll find 24/7 phone, chat and email support whenever you need it. On average, iPage claims to answer its calls in under a minute, which is refreshingly fast in the world of web hosting. But even when you don’t need specific help, iPage is still hard at work, rigorously QA testing its software to make your life easier. Starting at just $2.25/month for your first year of service, you’ll receive all of the amazing features discussed above with iPage’s Essential Plan. While you get one domain for free, you’ll be able to register and host as many domains as you’d like, which is excellent if you want to park domains on your site. Depending on the type of domain you want, you could register domains for as little as $8.99/year. iPage does offer some more premium features, which dedicate specific server space for your company to ensure that you receive faster load times and can support larger bandwidth, which start at $19.99/month. For people who have always wanted a website, but don’t want to dive into the deep end of the pool, iPage is the perfect site to dip your toe in the water. With handy step-by-step guides for every step of the process, you’ll always have a helping hand with iPage. This extends to the company’s customer service department, which is available 24/7 by phone, chat or email to answer any of your questions. But even if you’re an experienced webmaster, you’ll find plenty of enticing reasons to choose iPage, which has pretty powerful features to back up its ease of use. Best of all, iPage offers its simple yet powerful interface for a practically unheard of $2.25/month to start!